TERGO® UND Narrow-chassis reach truck - compact and just the right tool for medium intensive operations for higher stacking levels with very good stability and performance. Nimble and economical, and entirely designed around the operator to optimise your productivity. The UND is based on the narrow chassis, 1120 mm width and the unique wide ProVision mast system. Together these combine for lift heights of up to 8.950 metres and lifting performance of up to 1400 kg. If the UND reach truck is equipped with optional wheels for rail guidance, together with tapered overhead guard, it is also perfect in drive-in racking. Innovative ergonomic and safety technology ensure operator efficiency in a wide range of tasks - a boost for your warehousing, at exactly the right cost. Class leading ergonomics with UniCarriers unique ergologic mini steering wheel, ergologic multi function control, and superior visibility by means of the innovative ProVision mast design, added to reduce operator strain and improved efficiency. 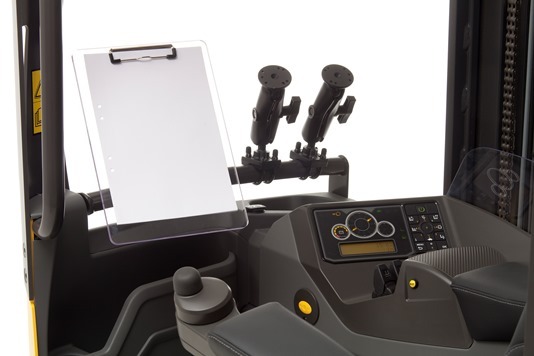 A wide range of optional equipment further increases operator productivity, such as ASR – Active Spin Reduction, LAS – Level Assistance System, and Ergologic operator interface. Are you interested in the UniCarriers UND? Everything with the UniCarriers TERGO® – from ergonomics to performance – is about productivity. High-precision mast design with soft stop technology and a fully damped reach system contribute to supreme stability in all conditions. Mast tilt and intuitive lift controls further facilitate loading and stacking at all heights. The hands-free direction control uses the accelerator for change of travel direction, allowing the operator to use the right hand for operating up to three hydraulic functions simultaneously. The powerful 48V AC motor provides excellent performance – top speed is 12.5 km/h. To maximise productivity and safety, UniCarriers Truck Computer ATC3, with personal PIN code for individual performance settings, allows the reach truck to suit each operator's driving skills. The spacious cabin is entirely designed around the operator. The unique mini steering wheel and floating armrest allow effortless manoeuvring during long shifts with minimum strain on arm, neck and shoulders. The seat and the armrests are easily adjusted to the individual operator – up to seven different parameters can be set. The Pro Vision mast design further enhances visibility and ergonomics when handling high loads. The separate footstep and a specially designed instep handle make it easy to get in and out of the truck. An ergonomic comparative evaluation study on reach trucks from three different manufacturers showed that the new UniCarriers TERGO® offered the most ergonomic working postures, resulting in less shoulder and neck strain. (Chalmers University of Technology, 2011). The UniCarriers S3 - Stability Support System - provides technology which ensures an unmatched industry-leading safety level. To maintain driving stability in a wide range of situations, the S3 technology continuously measures speed, steering, commands, mast movement and lift height of the truck. The new feature DCC - Dynamic Cornering Control- modifies the relationship between the speed of the truck and the operator´s steering wheel movements, allowing a higher level of cornering speed and when handling loads at high levels, the Optimised Performance Control adapts the tilt and reach speed to maximise stability and safety. The innovative feature LAS – Level Assistance System- is moving intuitive material handling to a new level. The operator needs only to release the lift lever slightly and the forks will stop automatically and with full precision at the right level. The UniCarriers TERGO® range is all about you and your operations. And to make your UniCarriers TERGO® even more you, there’s a wide range of specially designed options and accessories. UniCarriers TERGO® reach truck series is designed with focus on long service intervals and excellent serviceability. The unique UniCarriers Truck Computer (ATC3) with CAN Bus technology allows the service engineer to easily and quickly diagnose and service the truck, thus keeping uptime to a maximum. All UniCarriers trucks are designed according to UniCarriers unique Modular Design Concept which improves quality and limits the number of parts used. Our mobile service engineers therefore only have to carry a limited number of spare parts, which contributes to providing a First Time Fix Rate over 95%, resulting in a market leading uptime.